When thinking of a Caribbean vacation, the first things that pops into your head are the sun, sand, ocean breeze, and the sound of the waves. Cartagena de Indias is the Caribbean destination where every day is a good day to go to the beach. Discover a variety of beaches with diverse vibe in different locations. With an average temperature between 80 and 90 degrees Fahrenheit, tropical rain, and a brilliant Caribbean sunshine year round, Cartagena is my recommendation as the best beach spot in Colombia. Castillogrande (The Big Castle), a purely residential neighborhood where 50 year old houses have been replaced by modern high-end condominiums, is a peninsula completely surrounded by water. At one side you can appreciate Cartagena’s Bay; one of the most beautiful and award winning bays in South America, and at the other side kilometers of public and family friendly beach. Locals from the whole city frequent this beautiful landscape every weekend. Don’t expect clear waters for snorkeling. The city is in the north of the Caribbean coast and it’s surrounded by volcanic sand, slightly greyish in color, making the water darker than usual. However the warm sensation of the Caribbean ocean is still there for you to enjoy. Do expect one of the most amazing sunsets. The best time to catch some sun is around 3 in the afternoon. Order a local beer called “Aguila” and immerse in the sun, its changing colors, and its brightness, until it slowly disappears leaving you with a melancholic, yet relaxed sensation. 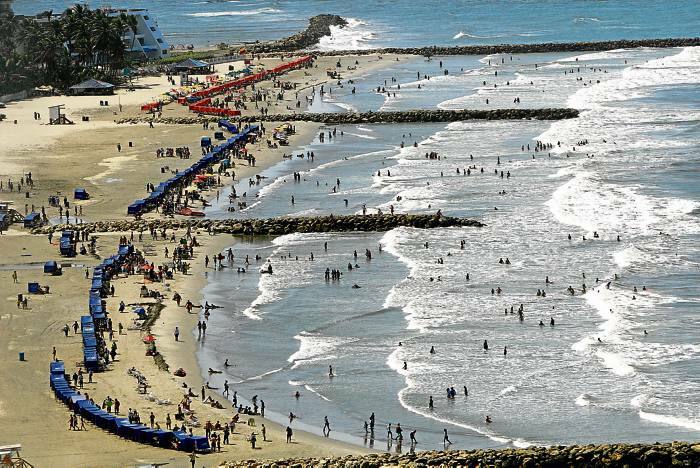 Bocagrande (Big Opening) has the longest of the city’s urban beaches, and it is recognized as a famous tourist beach. There is no specific timing to get there, from 6 am to 6 pm this beach is open 365 days year around. Try jogging early in the morning and relax enjoying a fresh lemonade always with your confidant, the sun. Don’t expect crystal clear water here either, the experience is similar to the Castillogrande’s beach, but this time the combination between tourists, Palenqueras (fruit basket ladies), local vendors, and women offering massages will definitely make you feel in another city. If you don’t care about people talking to you, approaching you to sell local products or even food, and at the same time listening to the variety of Latin music playing, this is the beach for you. When purchasing, just be sure to get the right price. 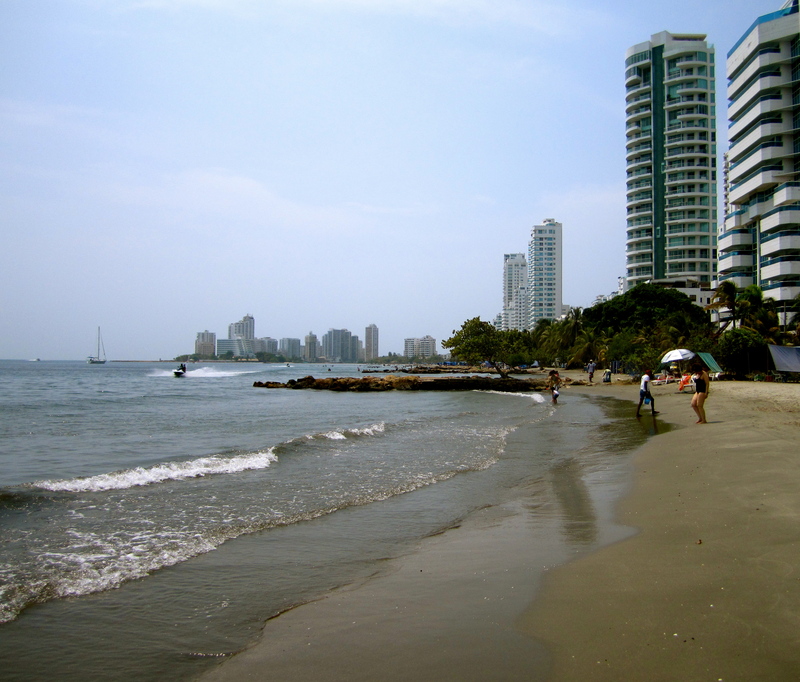 More on the gorgeous Beaches in Cartagena, Colombia!